Celebrating a very special rite of passage is the Goole gardening service charity, The Green Team, as it awards an official charity T-shirt to Goldcrest House volunteer Chris Coggins in recognition of his dedication and commitment to the charity. Green Team volunteer William Eshelby, (right), with dedicated volunteer Chris Coggins (left) sharing a happy moment. Wearing the uniform of the charity, Chris very much looks the part as he attends to gardening maintenance in Goole and the surrounding area to maintain the gardens of the elderly and disabled who are unable to do so themselves. 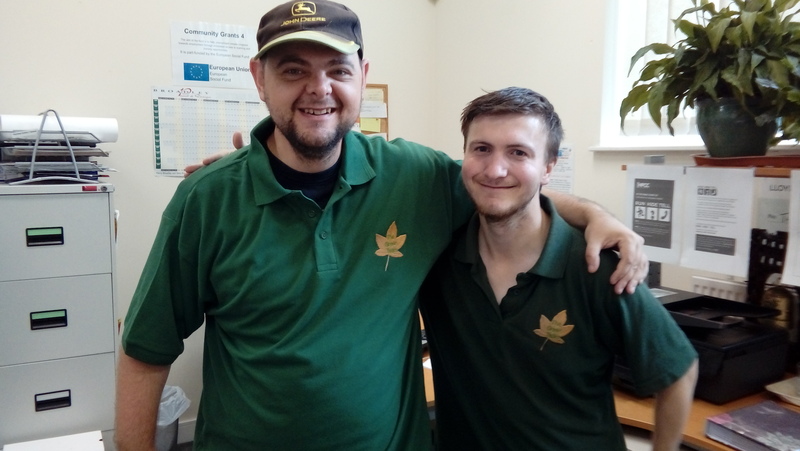 As part of a bespoke programme of personal development, created by Chris’s caring team at Goldcrest House, he now volunteers with The Green Team to advance his horticulture skills and practices via meaningful and structured work experience. The Green Team is a registered charity offering volunteering opportunities to local people who then provide a low cost gardening service to older and disabled people living in Goole and the surrounding area. The Green Team has recently secured funding to develop a wholly owned Community Interest Company and ‘volunteer journey’ project designed to train and prepare individuals for the job market, leading to the opportunity to apply for short term, paid employment working for the charity’s new commercial gardening service.